The field of community psychology has focused on individuals' and groups' behavior in interaction with their social contexts, with an emphasis on prevention, early intervention, wellness promotion, and competency development. Over the past few decades, however, community-based applications of the newest research methodologies have not kept pace with the development of theory and methodology with regard to multilevel data collection and analysis. The Handbook of Methodological Approaches to Community-Based Research is intended to aid the community-oriented researcher in learning about and applying cutting-edge quantitative, qualitative, and mixed methods approaches. 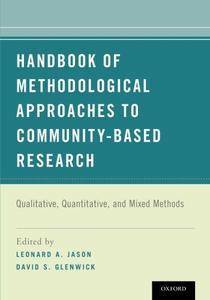 The Handbook presents a number of innovative methodologies relevant to community-based research, illustrating their applicability to specific social problems and projects. These methodological approaches explore individuals and groups in interaction with their communities and provide examples of how to implement and evaluate interventions conducted at the community level. The chapters discuss how particular methodologies can be used to help gather and analyze data dealing with community-based issues. Furthermore, they illustrate the benefits that occur when community theorists, interventionists, and methodologists work together to better understand complicated person-environment systems and the change processes within communities.